Neutral cracker that can be paired with anything! Has a nice buttery taste from the flax, and light, crisp texture. Eat alone, dipped in nut butter, hummus, guacamole, atop salads as a grain-free crouton, and more! Carb neutral for those counting carbs. 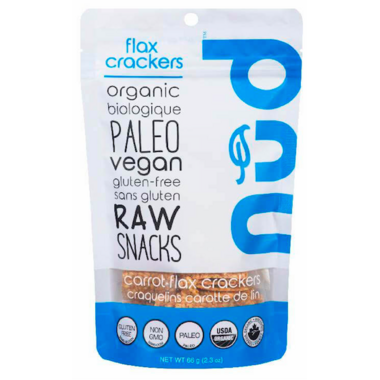 I liked these...not a huge amount of flavor but are a great crunchy substitute for carb crackers when you are doing Keto or low carb diet. They fill my need for cheese and crackers!! Not much flavour to these but they are great to have with cheese or dips etc. Hello KETO cracker!!! Love how light and crisp these are, unlike other flax crackers that break your teeth. Amazing! These are made of whole flax seeds so they have a different texture than most crackers. But they have zero net carbs and are crunchy.